June 20, 2018: Beriev Aircraft Company's amphibious aircraft BE-200ES made demonstration flights at the Biscarrosse Rassemblement International d'Hydravions in Biscarrosse, France. One of the meetings was held at the Airbus Headquarters to discuss the replacement of engines in favor of the PowerJet SaM146 - a co-production of Snecma (France) and NPO Saturn (Russia) and its certification in Europe (EASA) and in United States of America (FAA). 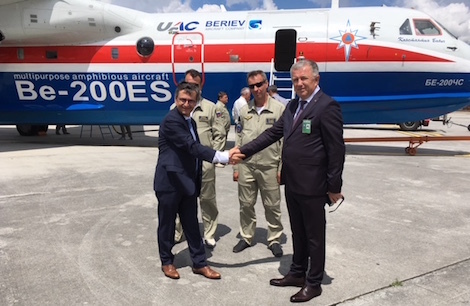 Russian delegation also met with representatives of Airbus pilot training facility to talk over the creation of a center to train flight officer for Beriev's BE-200ES. At the Biscarrosse Rassemblement International d'Hydravions © Beriev. Another meeting was held with the Seaplane Global Air Services Inc. (USA) to develop and consider the draft contract to supply ten SaM146-powered BE-200ES amphibians to the U.S. The contract may be signed by the end of this year.